Watch "gavel-to-gavel" coverage of the 2016 Democratic National Convention from PBS NewsHour from July 25 to 28. The 2016 Democratic National Convention takes place in Philadelphia and features headlining speakers President Barack Obama, First Lady Michelle Obama, Senator Bernie Sanders, former President Bill Clinton, and 2016 Democratic Presidential Nominee Hillary Clinton. Visit our Election Center for more news, videos and analysis of the 2016 Presidential Election, and visit our Election Social Hub to test your knowledge of conventions or to see what the media and nominees are saying. 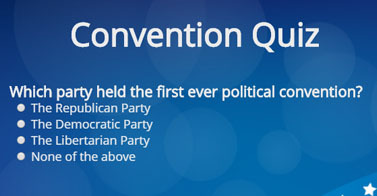 Test your knowledge of political conventions throughout the years with this quick quiz. Visit our Election Center for in-depth articles, video and social media coverage of the conventions.